In Jane Austen’s ‘Sense and Sensibility’, calm Elinor is an artist and passionate Marianne is a musician. Not that I disagree in any way to this choice, I sometimes thought that this could have been reversed, with the logical sensible sister being the musician and the emotional sensibility sister being the artist. ‘Paint and Piano’ was born of this springboard ‘what if’ seed, and since I always loved the idea of identical twins (either being one, or having them), the Hudson sisters are exactly alike in their genetic appearance, but not quite so in their natures nor dress and style. Steady Cadence plays piano with rhythmical precision while flamboyant Florence paints with colorful flair, and of course, their lives and choices assuredly follow their talent tendencies. After a little explanation from me, my daughter Brina created my fictional twins wonderfully, with gregarious Florence in silky flouncy purple next to her painting of red roses, while subdued Cadence sits on her piano bench wearing simple ivory plus little hints of black, like the keys that she so often plays. A close-up of the Hudson twins’ faces may suggest that they are inspired by images of the same model (a favorite actress of mine) but their hairstyles and facial expressions tend to hide that fact almost as much as their differing dress. 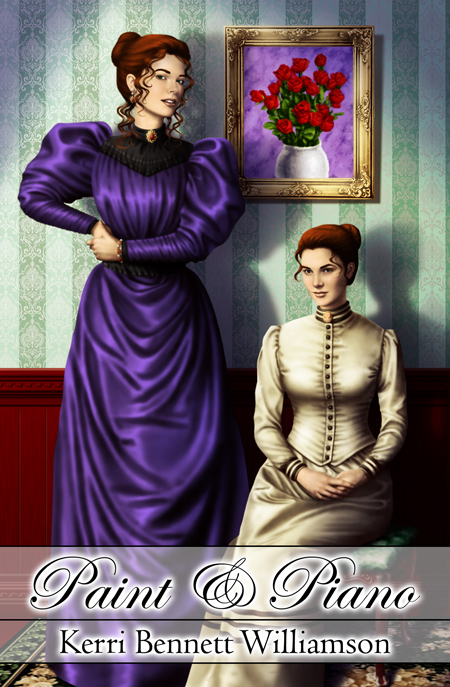 As my first ‘beyond the frontier pioneer’ fiction and further ahead in the eighteen hundreds timeframe, I wanted the cover to show Victorian details to set the story stage of the era. Still existing somewhere out in the American west, but far less rugged; this novel could focus far beyond the realm of mere survival, and more on distractingly pleasant things. The Hudson family are well-to-do comfortable enough that there is no need to worry about any next meal, shelter or staying warm and all such basics, and thus Mrs. Hudson is free to only worry about such as getting her twin daughters married before they begin to appear old enough to be considered spinsters by anyone. The lady of that house and family must needs throw parties, even as she tries to throw eligible young men at her girls. This novel was great fun to write, and though I meant for the parents of the girls to be more in the way of background characters, they kept pushing their way forward with lively banter that reminded me greatly of Mr. and Mrs. Bennet in Austen’s ‘Pride and Prejudice’. Indeed, the parental pair kept me from sleep many a night with dialogue rushing in and so I was compelled to jot down what they were saying in the forefront of my head. In fact, I was trying to finish another novel or two first, but this one jumped to the front burner not to be ignored, in great part because of the parents in the story. I’ve been told that this is a comedy. I chuckled a good deal while writing it. Whatever my ‘muse’ is, she was certainly over my shoulder channeling this one. I thoroughly enjoyed being in the midst of the process of creating this little world and family. Although I am capable of intermittent moments of humor in real life, I am generally a more serious person and prone more to drama (even melodrama! ), so I never thought I could write something light and fun like this. Just about when I finished saying I could never write anything remotely close to a comedy (thinking that would be the most difficult thing for me to ever achieve), this story began flowing in, and therefore, it is one of my personal top favorites – a little gift to me from the stars above, or so it seems. This is my kind of story.